I had a “use it or lose it” revelation a few years back. Hip pain, back pain, knee pain, etc. I decided to start hiking again because I could see that my sedentary life would make me miserable in the future. I really enjoy the outdoors, hiking, and photography. I started out with hikes that are just a few miles and have worked up slowly to the longer hikes in our area. The longest I have done (to date) is a 10 mile snow shoe hike. I am not a fast hiker. In fact I usually hike slow and like to take in the scenery. I often stop for photos, and take the time to really enjoy what is around me. Since hiking alone is not really a good idea – I have a group of great friends that hike with me. The photo of me on this page was taken near Lost Lake by my friend Andrea. This was during a very cold snap we experienced – it was only 18 degrees at the lake and this was at the top of a trail at about 4000 feet. 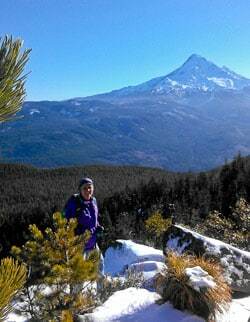 Loved this hike and plan to do it again in June when the wild Rhododendrons are blooming. For me hiking is giving back my mobility and my health. I plan to hike every weekend – even if it has to be a short hike. 2 years ago you would have never caught me snow shoeing, or doing anything in the snow. Now I am enjoying the outdoors in every season! If you want to join me on some of my hikes feel free to read the page that has my “hiking rules” then contact me. I will add you to my notification list that announces where the hike will be for the following weekend. Feel free to enjoy the photos on this website, but remember they do belong to me. You can share on Facebook from this website, but no printing allowed. Contact me privately if you would like a print of one of my images.